Erin Carlson – Writer, "I'll Have What She's Having"
I’ll Have What She’s Having arrives August 29! 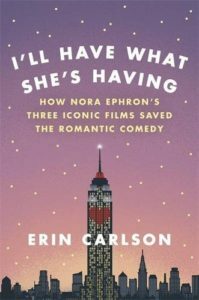 In I’ll Have What She’s Having, journalist Erin Carlson goes behind the scenes to tell the story of Nora Ephron and how she reinvented the rom-com through her trio of instant classics: When Harry Met Sally, Sleepless in Seattle, and You’ve Got Mail. But in the process, Ephron also remade herself – from a tough, suffer-no-fools Manhattan journalist to a fierce and unflinching Hollywood power player with the clout to get her movies greenlit … all while redefining romance for an entire generation. With a cast of famous faces including Rob Reiner, Tom Hanks, Meg Ryan, and Billy Crystal, Carlson takes readers on a rollicking, revelatory trip through Ephron’s New York City, where reality took a backseat to romance and Ephron — who always knew what she wanted and how she wanted it — ruled the roost. If you consider Ephron a diehard romantic, you’d be mistaken: in fact, the woman pulling the heart-strings wasn’t always drinking the cherry-flavored Kool-Aid. So how did the writer-director regain faith in the L-word following one broken engagement and two failed marriages? What sparked Reiner to snap out of his bachelor blues during the making of When Harry Met Sally? Why was Ryan, a gifted ingénue who was much more than an adorable face, not the first choice for the role of Sally? Why was Hanks so reluctant to take on the role of Sleepless protagonist Sam Baldwin? And more importantly: What was Dave Chappelle doing in You’ve Got Mail … in a turtleneck?